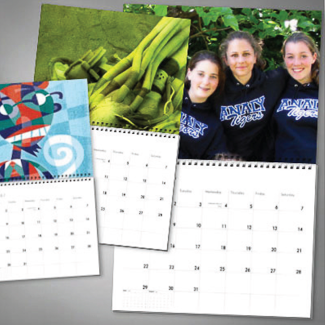 Custom calendars can keep you in front of your clients, friends and family all year long. Even in a digital world, promotional wall calendars continue to make their mark. From homes, break rooms, lunchrooms, and water cooler areas to customer service counters and executive offices, the workplace provides many opportunities for a company to conduct inside advertising with calendars. The large date squares for adding appointments and reminders as well as all American and Canadian Holidays make your Personalized Imprinted Calendars an attractive Promotional Gift Item and a useful daily monthly planner too! The variety of choices you have is almost endless. Photo calendars, 12 month calendars, personalized calendars, holiday calendars. The list of calendars goes on and on. What a terrific way to share a special memory, a family outing, holiday pictures, or any images you choose. A personalized digitally produced photo calendar is easy to design, easier to produce and adds a personal touch to the months for the owner!